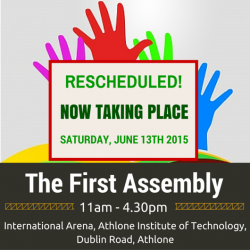 At Áiseanna Tacaíochta (ÁT), we’ve taken the decision to reschedule the First Assembly from Monday, 4th May to its new date of Saturday, 13th June 2015. The Assembly will still take place in the exciting surrounds of the International Arena at the Athlone Institute of Technology (AIT) on that day. Recognising the difficulties being experienced by participants around reduced public transport and access options on the bank holiday, we feel that this decision will ultimately enable a greater number of people to journey to Athlone with more ease and flexibility. It’s very important to us that as many people as possible can join in and contribute to this important day for the disability community in Ireland, and we hope that the impact of the day will be more deeply felt by all as a result of this decision. We very sincerely apologise for any inconvenience that this causes to you, particularly if you have already made transport or accommodation arrangements. If you have any queries or experience any issues arising from this decision, please do get in touch with our Communications Officer, Orlaith Grehan, by emailing orlaith@theatnetwork.com or calling 086 183 1502. If you have already signed up to attend the Assembly, your details will automatically remain registered for the new date of Saturday, 13th June. If you would like to change this or have any questions about it, please contact Orlaith at the contact details above. If you would like to find out more about the First Assembly and to register for the day, please click here.